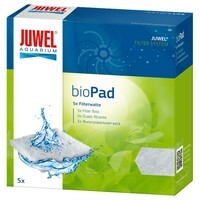 Juwel Aquarium BioPad Filter is used to catch coarse particles of dirt in the water of your aquarium. Consisting of a fine, residue-free polyester material, the Juwel BioPad is suitable for both saltwater and freshwater aquariums. As a mechanical pre-filter, it protects the filter from rapid soiling and means that the other filter media doesn’t have to be cleaned as often.